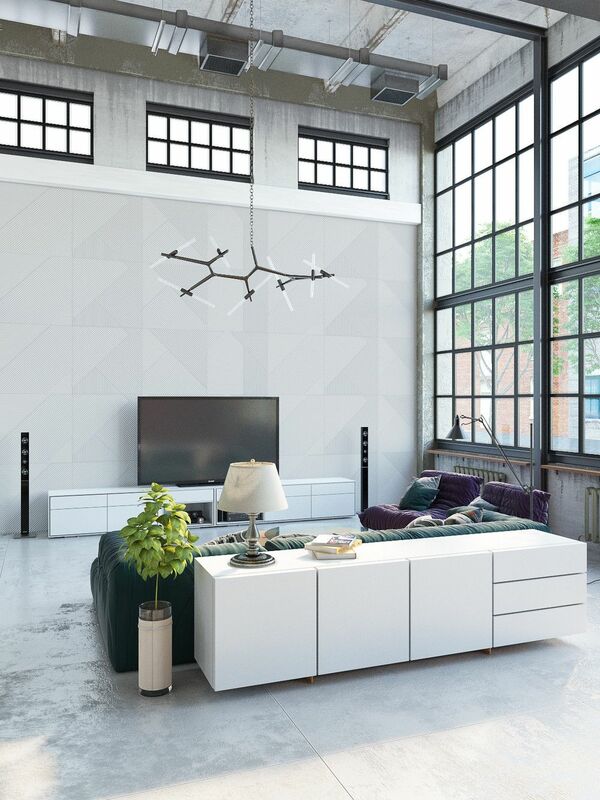 There's something so poetic in taking an old factory and turning it into a modern home. 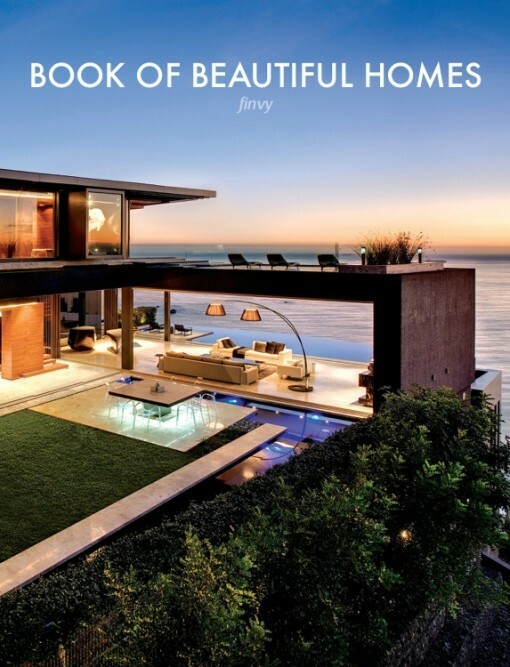 Designers take something old and dilapidated and give it a new purpose fit for the 21st century. 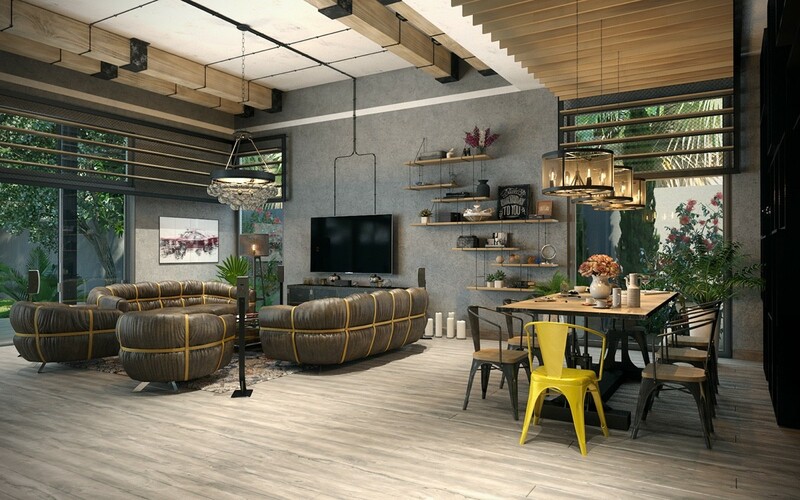 This trend has taken the world by storm- decrepit factories, warehouses and offices are being transformed into state-of-the-art lofts. We're going to take you on a tour from Dubai to Hungary, into the some of the most impressive industrial lofts that you've ever seen. Join us in the industrial loft revolution. We start our tour in Budapest, Hungary. To give the space a more industrial look, the plaster was removed from some of the walls to expose the brick and concrete underneath. Other walls were plastered and renovated with decorative panels. 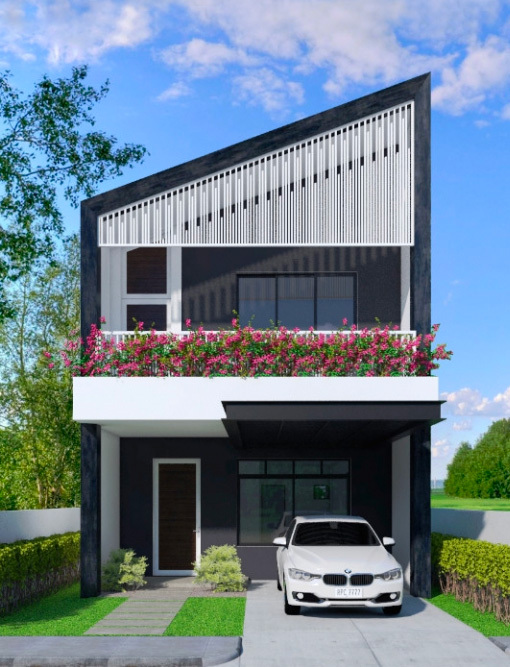 The space is now a fusion of color, texture, and geometric design. The different colored couches and books brighten up the room. The black pipes that support the library and make the step ladder add to the overall industrial theme. While textured wall panels are a subtle design feature that doesn’t overcrowd the space. The original windows have been left open to allow natural light in. The white cabinets are a modern touch, while the ceiling light is a lively geometric twist. The uncovered tubes and vents are reminiscent of the original industrial factory. The distressed green cabinets and red chairs are a colorful pop in the room. The room is well lit thanks to the symmetrical light fixtures. A table in the kitchen turns the space into a kitchen and dining area, uniting two different areas for function and to save floor space. 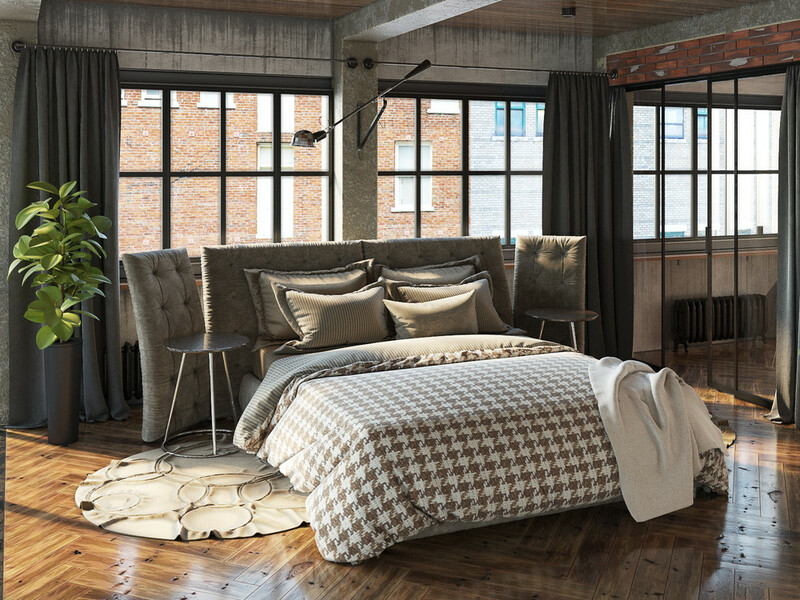 A private study in the bed area is kept stylishly simple and functional. Old filing boxes are a vintage and stylish storage solution. 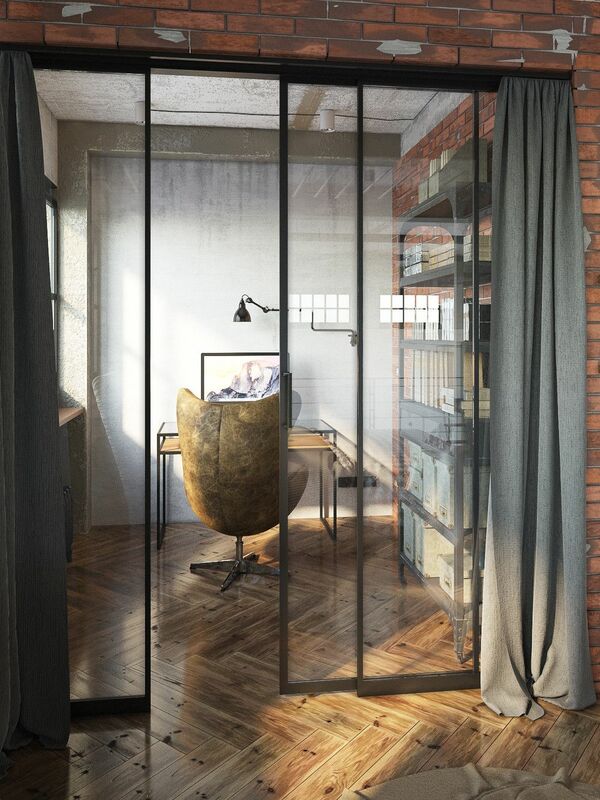 A curtain and glass sliding door keep the study private. The patterned bed spread and colored pillows warm up the whole area, and a potted plant is a refreshing ornament. 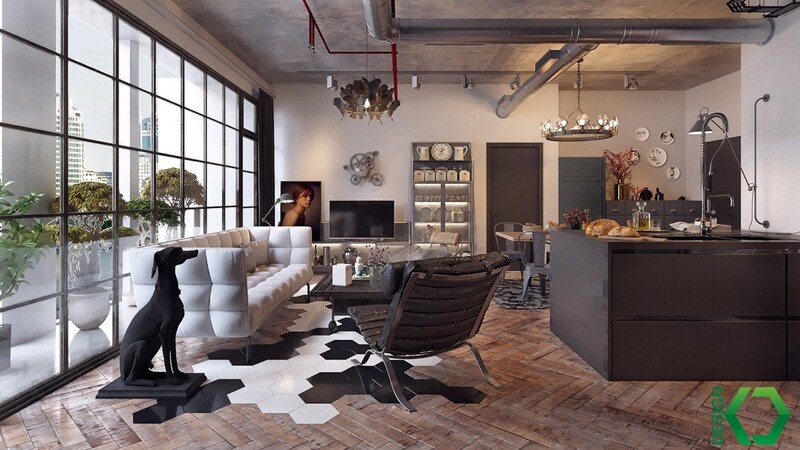 The wooden floor and fashionable carpet soften the raw industrial elements. 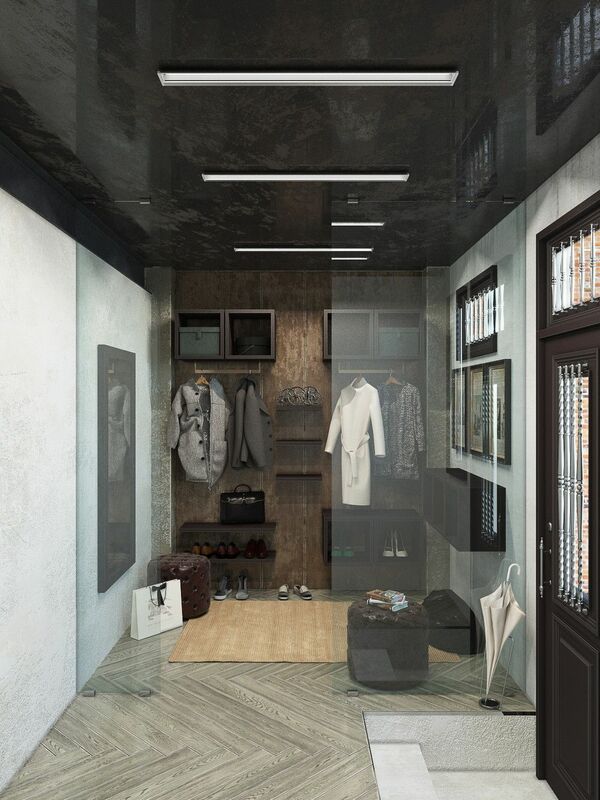 A dressing room is stylish feature for the house owner with an ample closet. 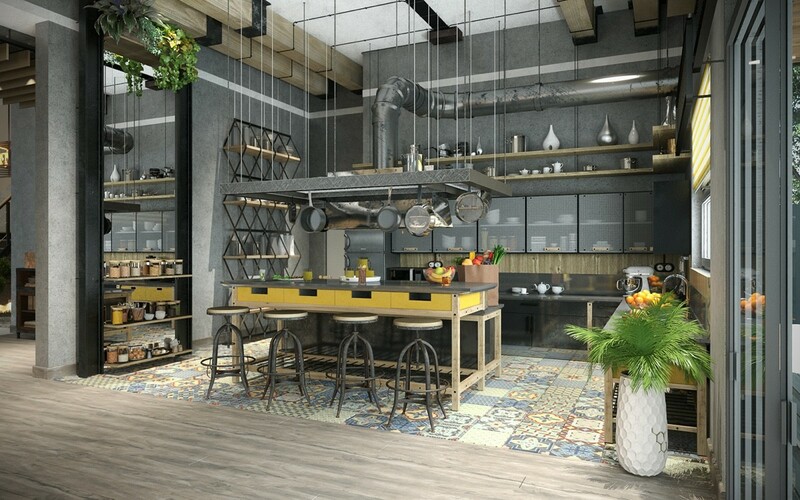 The cement walls and black grating on the ceiling continue the industrial design concept. 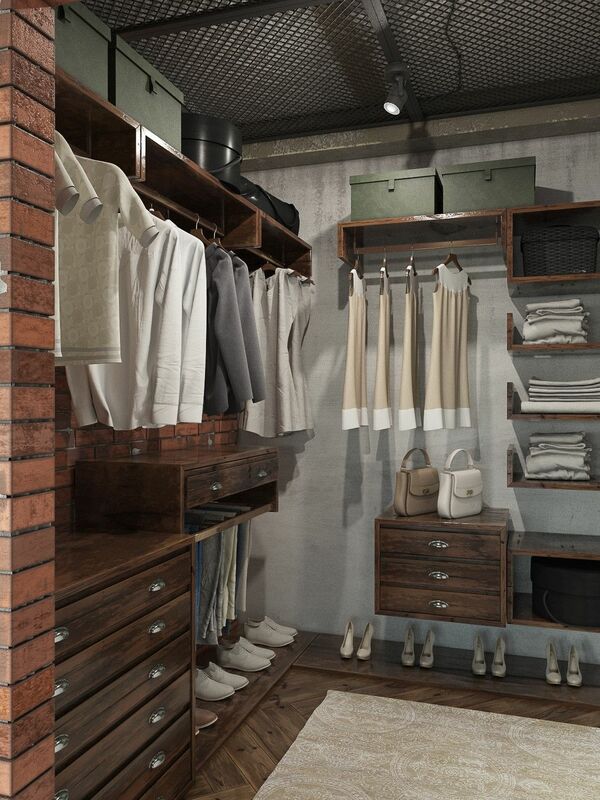 The coat room is a creative and useful design feature. The bathroom is light and airy, the color scheme giving the illusion of space. 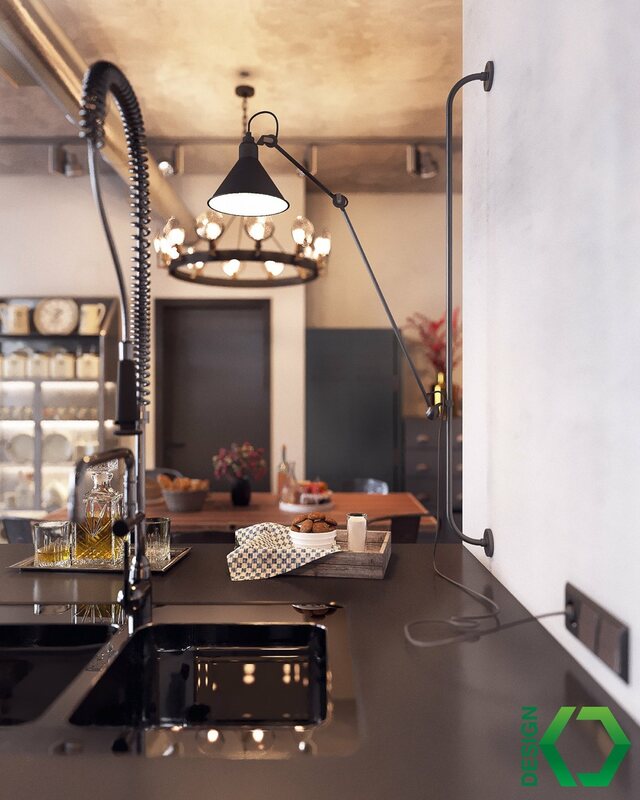 A large metal framed mirror and iron light fixture fit into the industrial theme, and a wooden utilities table adds a distinguished atmosphere. 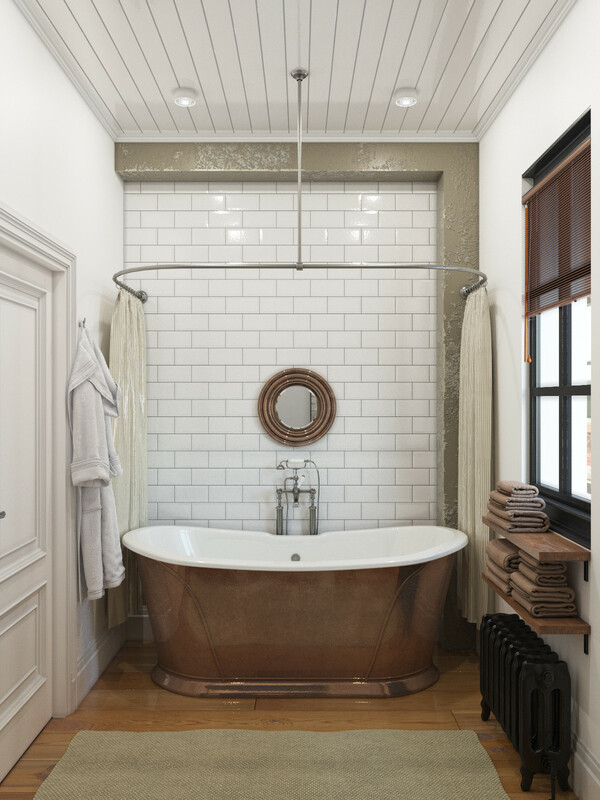 A copper bath is perfect for the space. 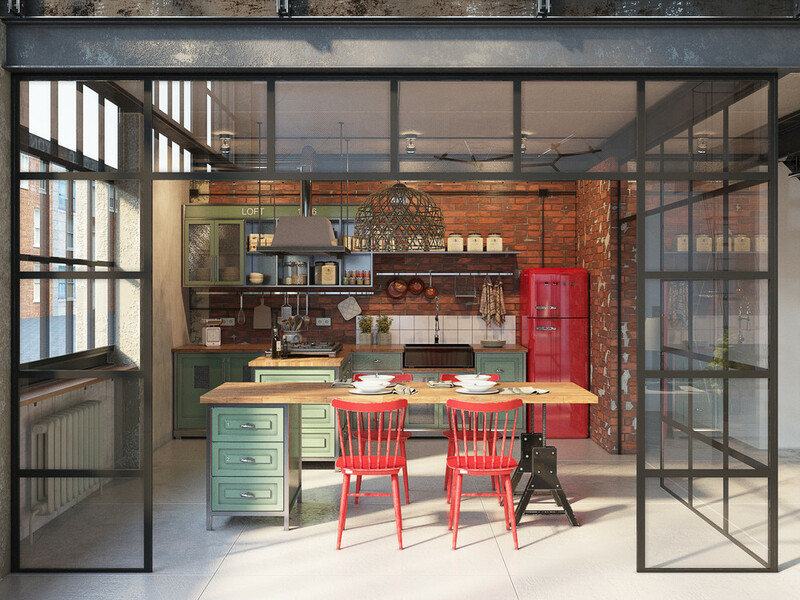 It contributes to the industrial theme as well as being vintage and incredibly stylish. 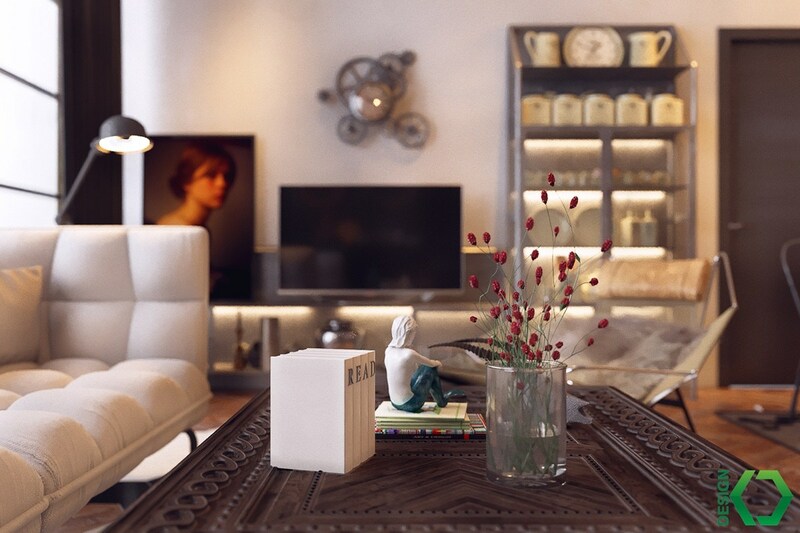 A carpet, dark wood shelves and the copper prevent the room from feeling cold and impersonal. 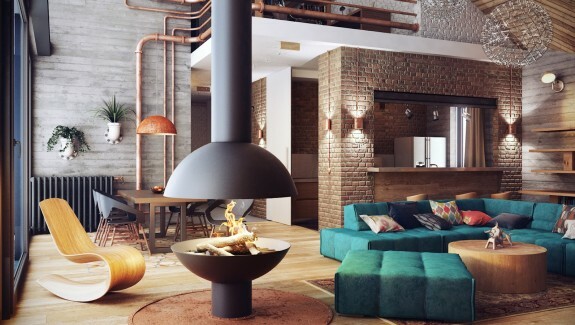 A vintage heater is another industrial decoration that contributes to the overall atmosphere. 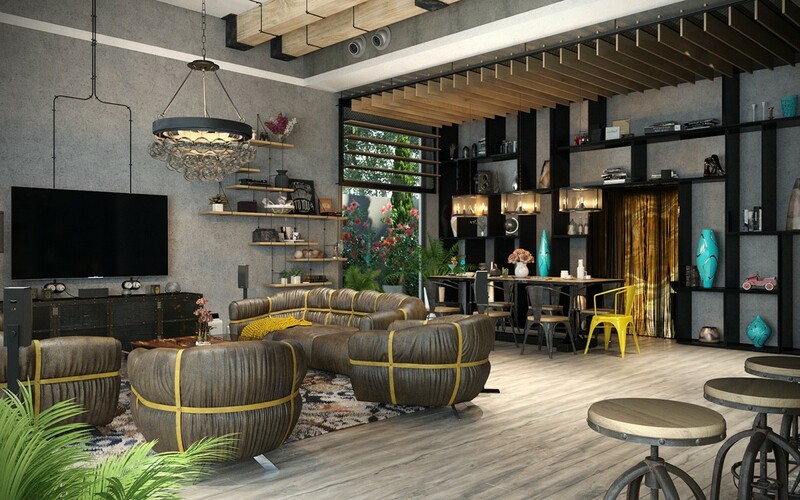 Originally an old garment factory built in 1928, the loft has been opened and renovated. 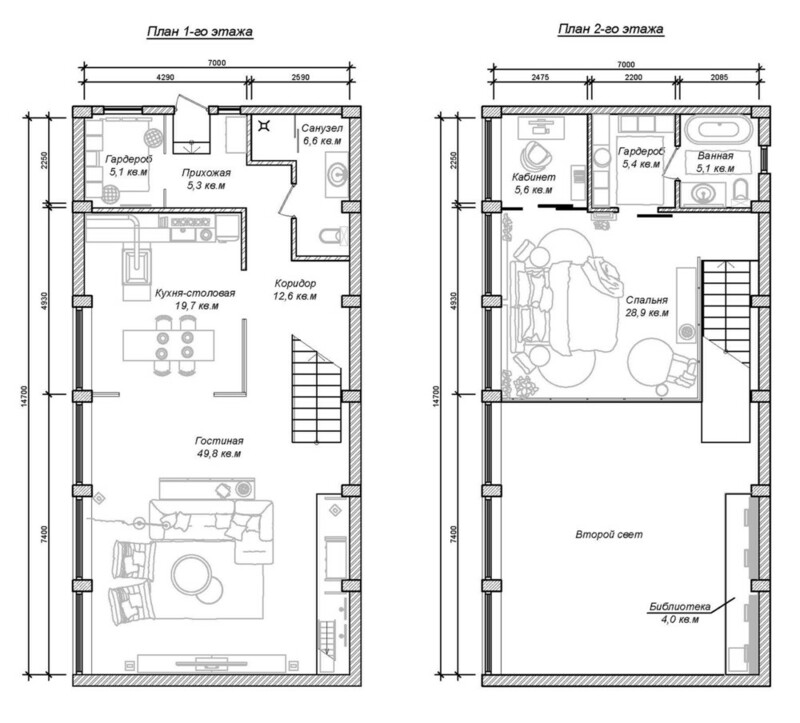 The top floor consists of a bedroom, study, dressing and bathroom. 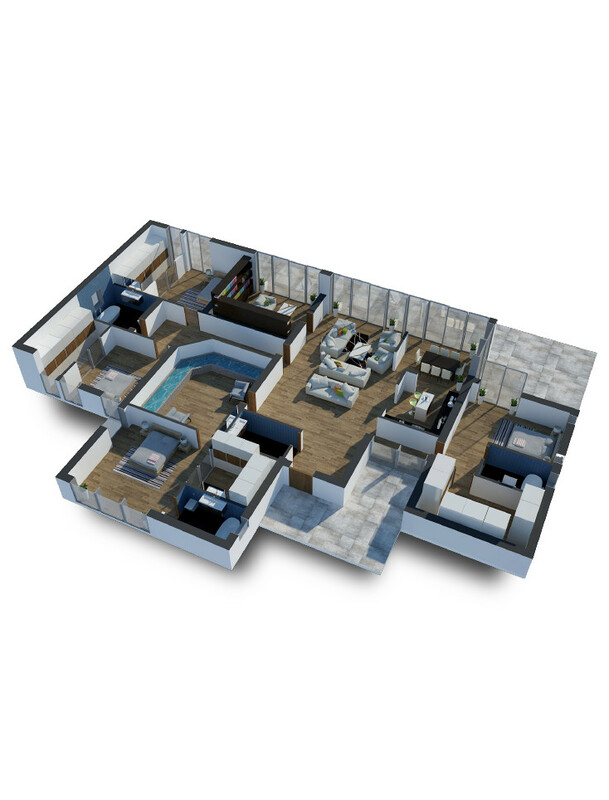 While the bottom floor is made up of a living area, kitchen-dining area, coat room, library area and guest bathroom. Next stop in the tour is Ho Chi Minh City in Vietnam. 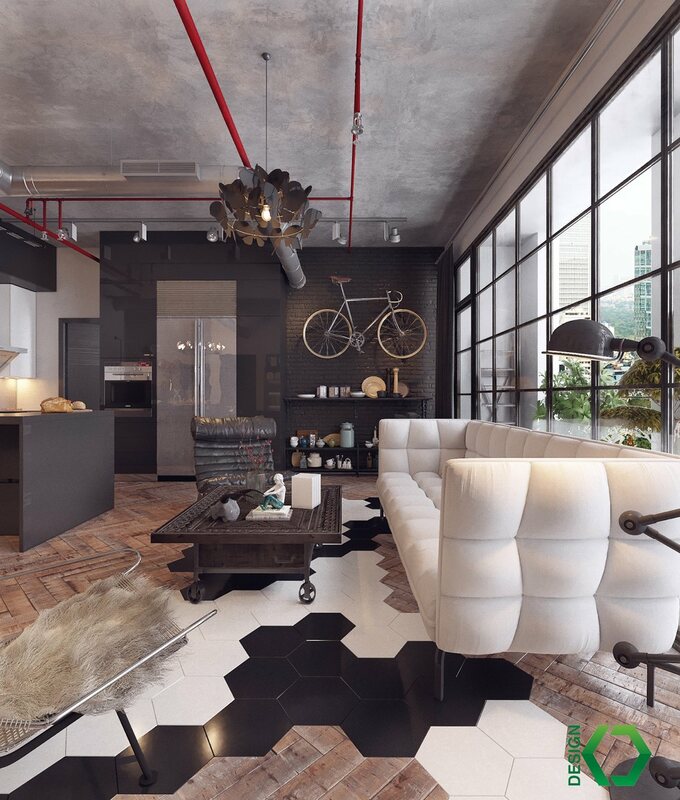 The color scheme for this loft is more neutral with grey, black and white being the main colors. 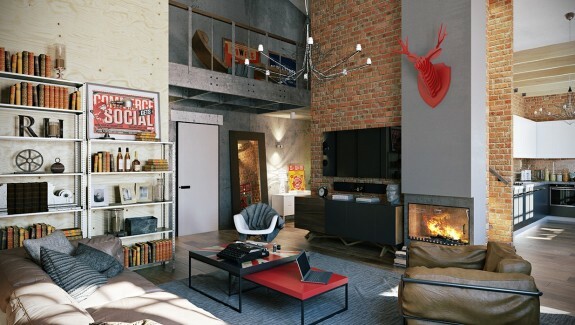 This loft focuses on the more sophisticated industrial design. A gorgeous engraved wooden table is a warm and sophisticated adornment. Delicate and detailed ornaments add a personal flair. 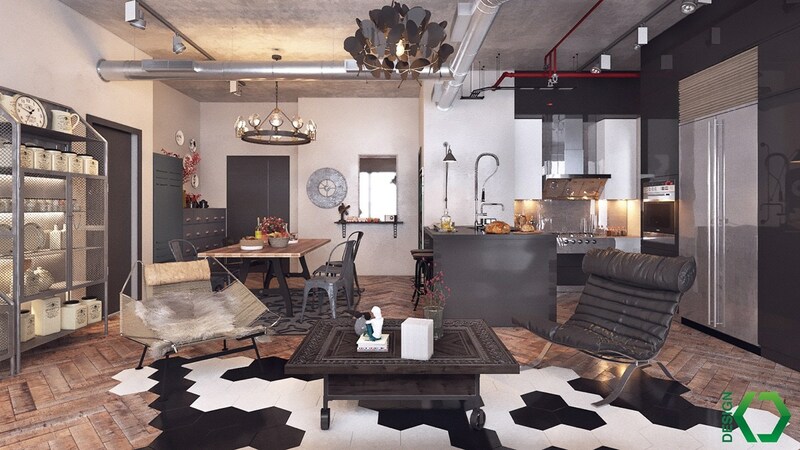 The design for this loft focuses on geometric designs along with raw industrial elements. This achieved through the custom geometric tiles on the floor, the industrial style light fixtures, the uncovered pipes and taps. 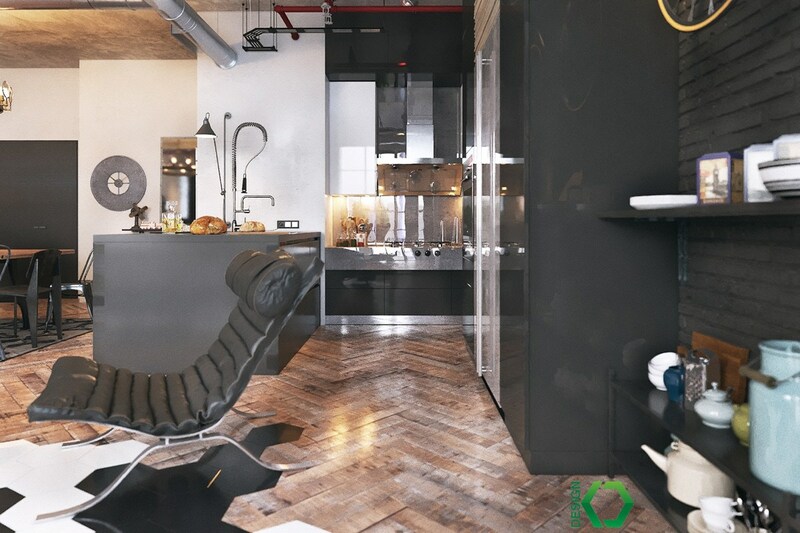 A wooden floor warms up the space and provides some texture to the overall design. 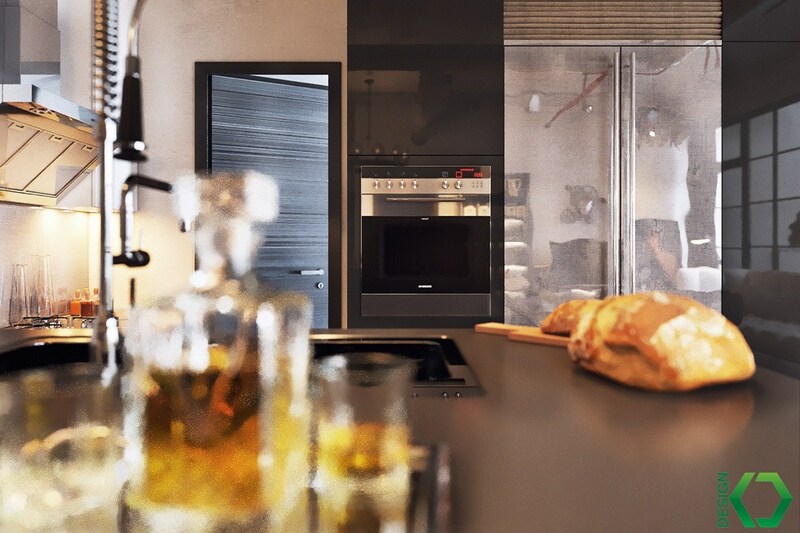 The kitchen aims sleek and modern, with chrome providing the industrial component. 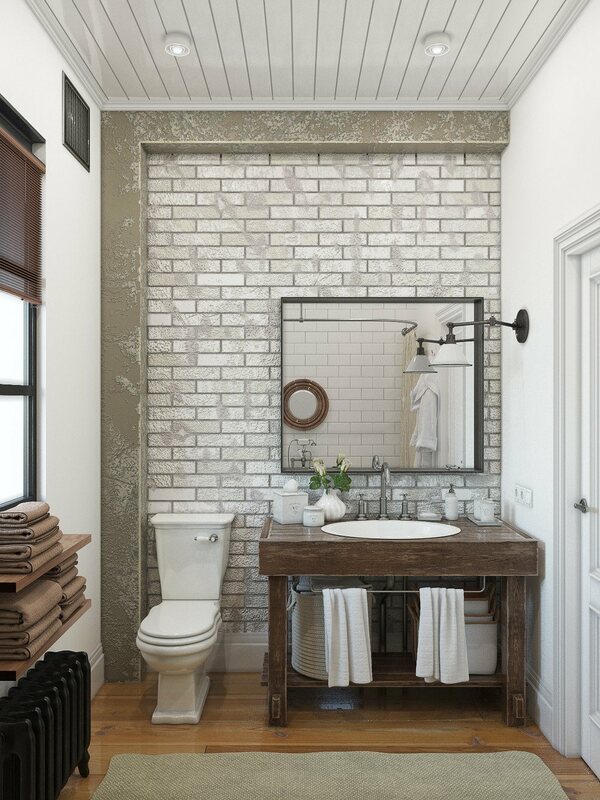 The vintage industrial chairs are expertly paired with wooden counter tops and iron light fixtures. A fluffy, patterned carpet ties all the different aspects together. A vintage mounted bicycle takes the space back to it’s roots while being a whimsical trinket. 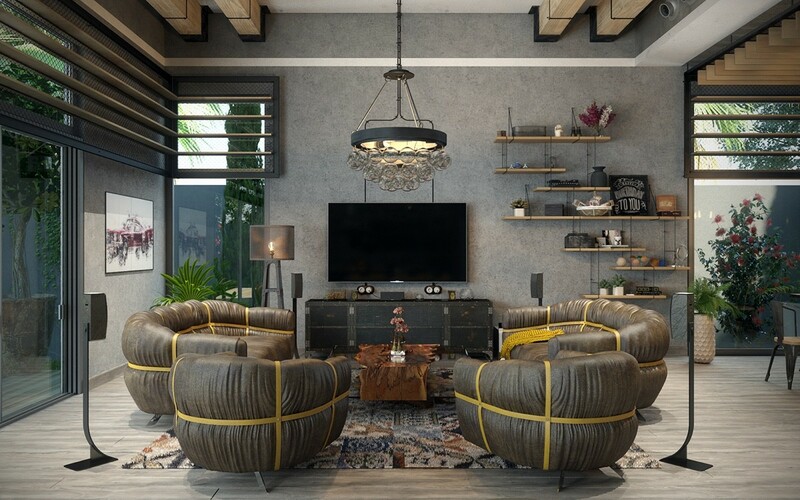 An essential design feature is the round chandelier that is adds to the industrial glamour atmosphere. 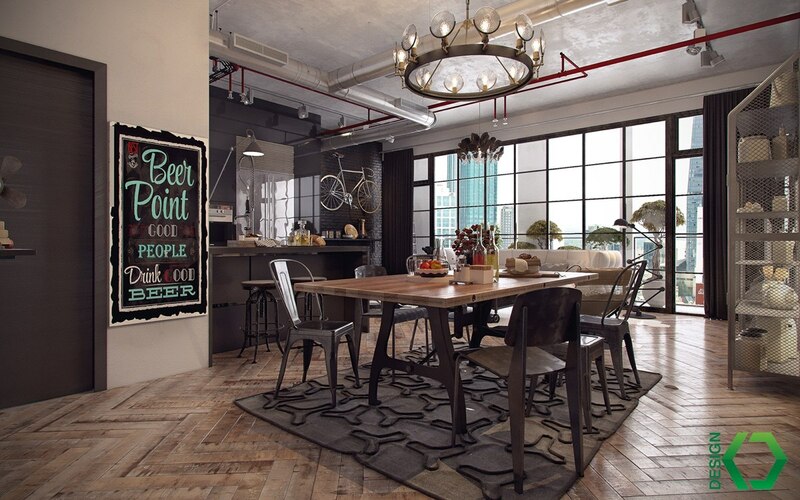 A mischievous sign board brightens the room, and prevents it from being too serious. 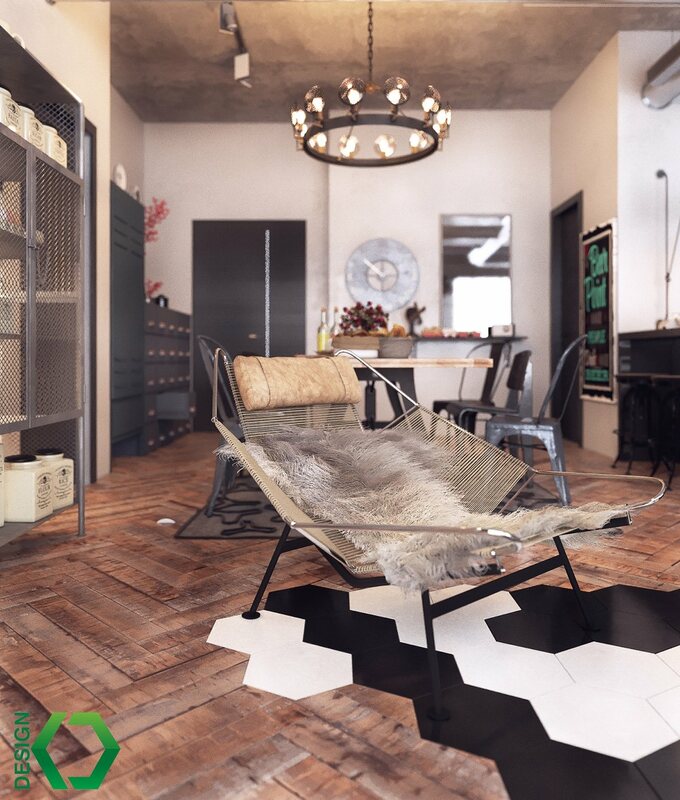 This unique chair is a chic facet as it rests loftily on the custom accent flooring. 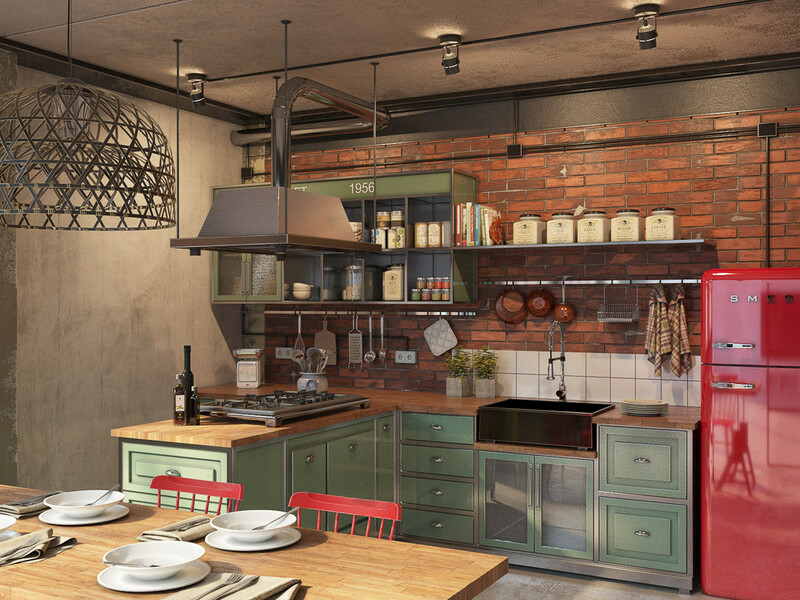 An important design feature in any industrial style loft is the light fixtures and uncovered pipes. Our final stop is in Dubai. 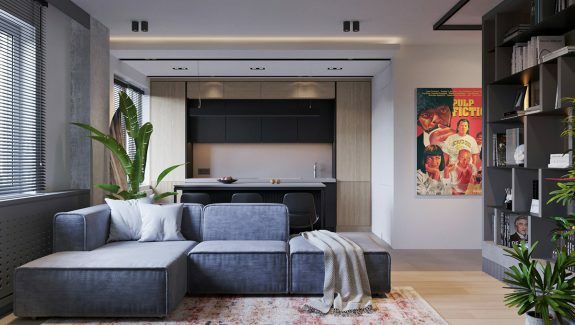 While being industrial, the living space is also colorful and includes nature. 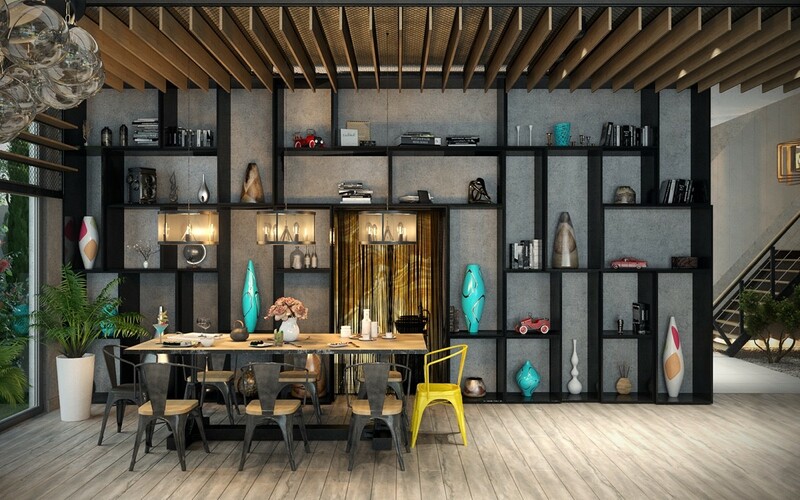 The open plan living space includes a accent wall with shelves and a multitude of artistic ornaments. 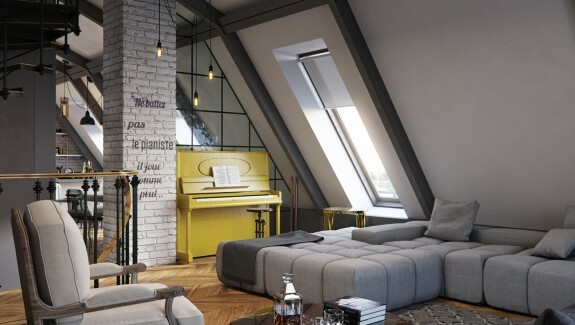 The uncovered windows include the garden into the decor, and the splashes of yellow remind one of a bright sunny day. 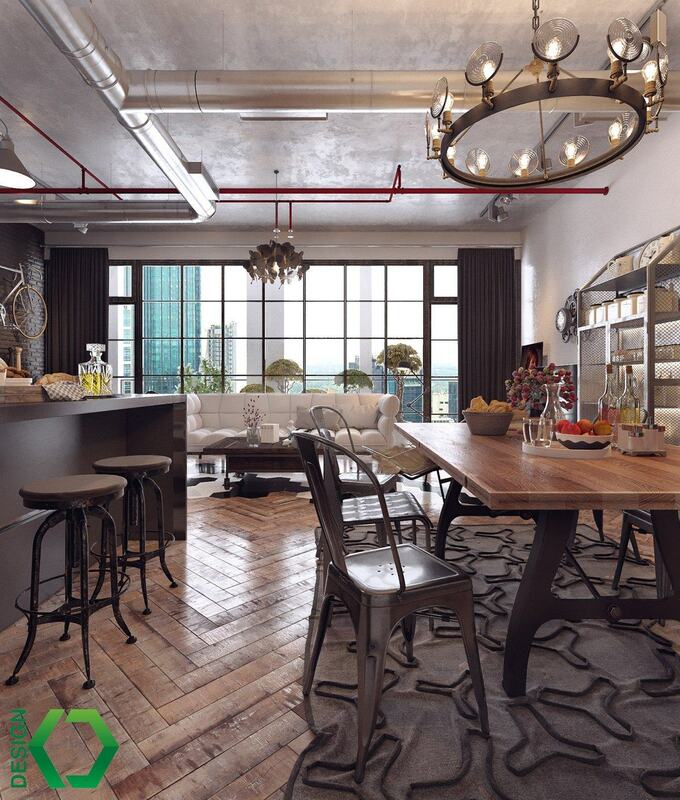 The wooden flooring unites the entire space and adds a wavy texture, while a self standing lamp is a trendy component. The overhanging wooden slats incorporate the ceiling into the accent wall and is an innovative design feature. 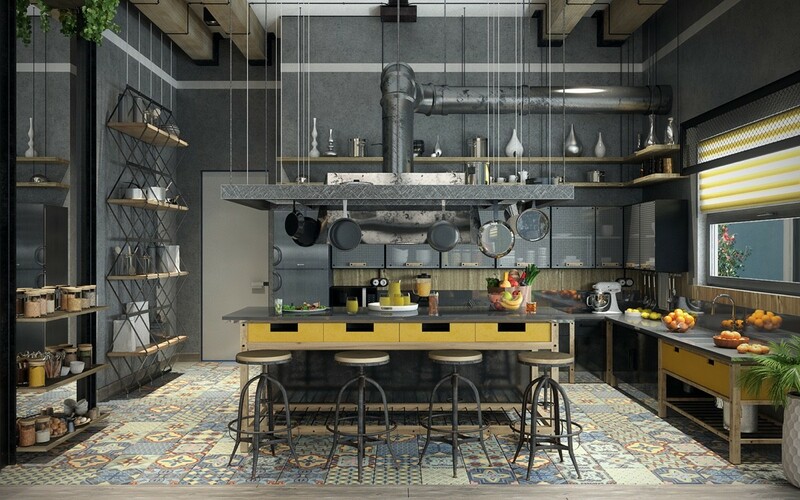 The kitchen is undeniably industrial chic, while the quilted carpet is a unique aspect that creates a homely atmosphere. Feeling inspired? 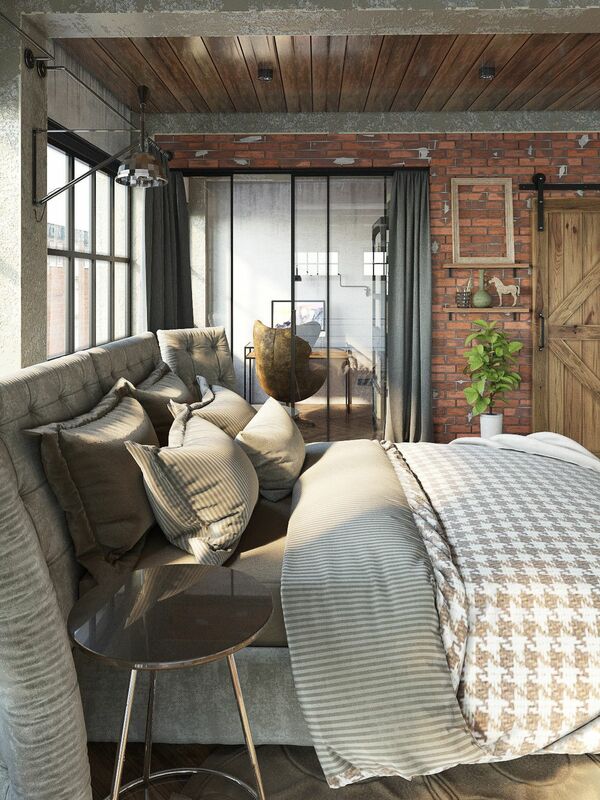 Why not take a look at our other Industrial style loft posts? 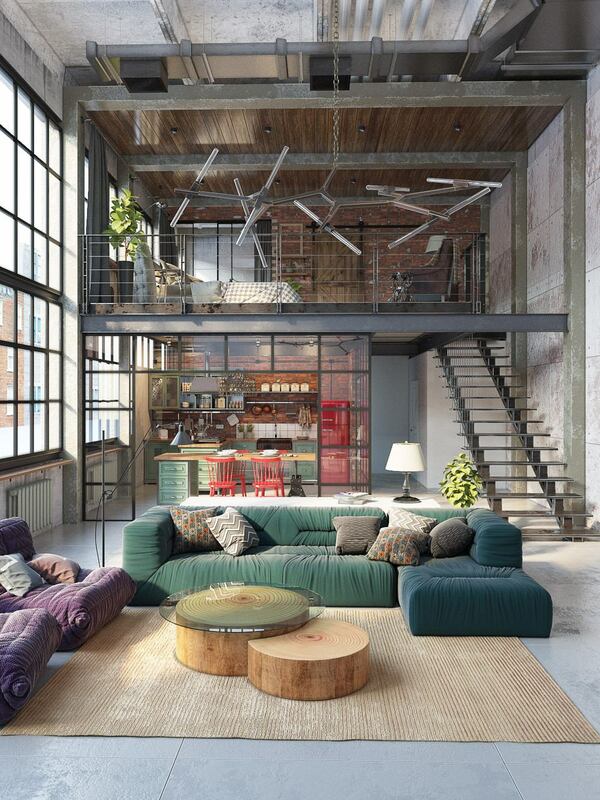 Industrial Lofts and Industrial Style Furniture.